I've been sick. So in complete self-pity fashion, I bought myself a cup o' noodles. Not that it was a splurge - 6 for $1.50 (no wonder some live on these things, I thought). I had a cup for lunch today. While Jordan squirmed and snubbed his foodie nose, I felt like I'd been transported right back to McLeod Elementary. Let me tell 'ya, this was the creme-de-la-creme of lunchtime. 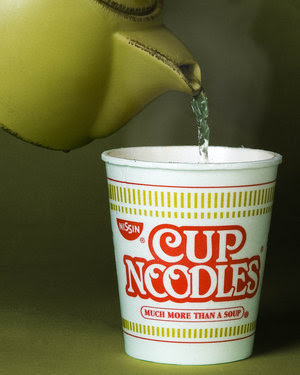 Cup o noodles was the fanciest lunch treat we'd ever heard of back in the day. And Jordan - at least I've (mostly) graduated from my elementary food tastes (yes, pun intended) and I don't feed you macaroni & cheese with hotdogs. Ever.